Nobody likes dealing with dog poop, but picking it up is just a part of being a responsible pet parent. Besides being unsightly, dog waste can actually be an environmental hazard. Left un-scooped, bacteria and parasites from your dogs waste often find their way into nearby groundwater. Unfortunately, knowing that you are doing the right thing by picking up after your pet doesn’t make the task any more pleasant! For us, the biggest annoyance with dog poop is not picking it up, but being stuck carrying it around for the remainder of the walk. Trying to juggle one, or in our case multiple, leashes and a stinky bag of poop is not exactly a pleasant experience. I hate wishing away our time together just so I can get home to a garbage can to toss it out! Thankfully there are ways to make cleaning up after your pet less disgusting and intrusive, and we are going to be showing you one of those today! 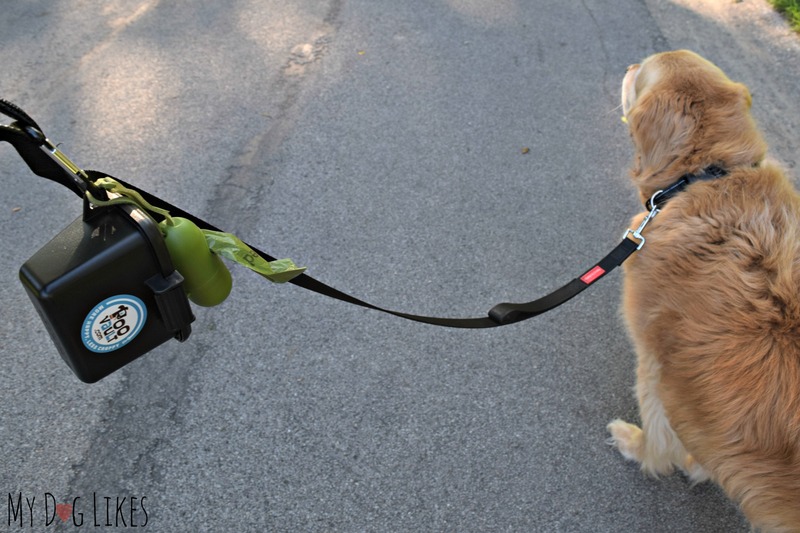 The PooVault is a leash or belt attachment that is designed to carry your dogs waste after they have done their business. This handy device is made of a durable plastic and snaps closed to keep smells locked inside. 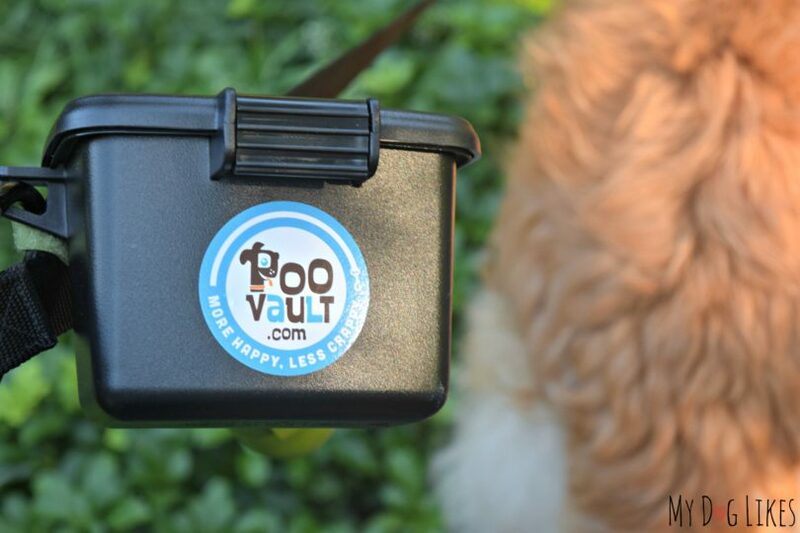 The folks over at PooVault were kind enough to send us one to try out, and they are sponsoring this post so that we can help spread the word about their new product! The first thing we noticed about the PooVault was how tough it is. 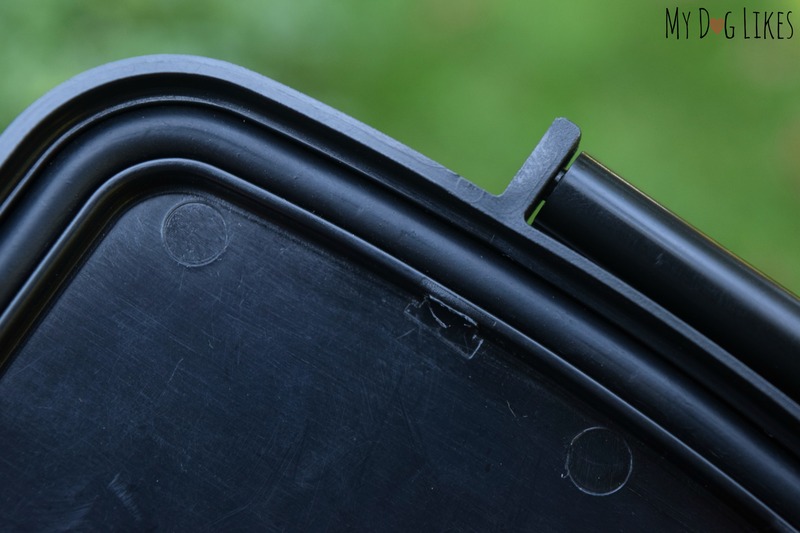 Constructed from High Density Polyethylene (HDPE), this thing is clearly built to last. It is not going to break if (when) you accidentally drop it on the ground and it would also be very easy to clean should the need arise. 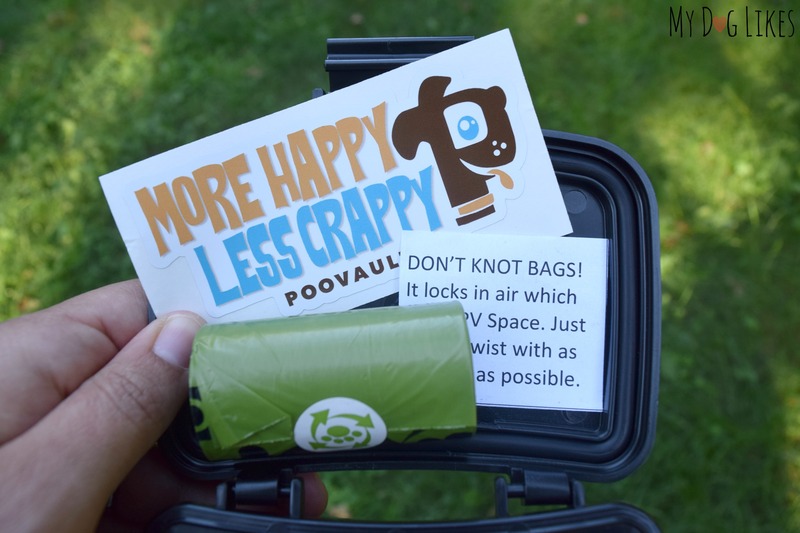 When you open your PooVault you will find a roll of poo bags and a hilarious “More Happy, Less Crappy” sticker inside. We thought that including the bags was a really nice touch, and they weren’t just any poo bags either – but high quality and eco-friendly ones! Though on the surface it is a pretty simple device, the PooVault has incorporated several great design features to achieve its goal. 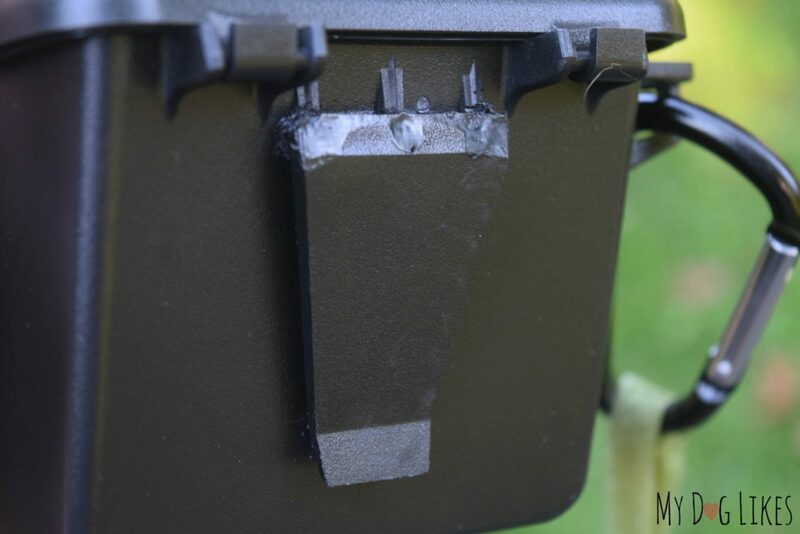 The latch of the PooVault is very heavy duty, and requires a fair amount of force to open. We felt confident that it wasn’t going to accidentally open and that it would work well for years to come. The PooVault has an opening of 5” X 2.25” and a depth of 3.5”. This gives it an overall volume of 400ml. In order to maximize the space inside, the manufacturer recommends spinning your bags instead of knotting them in order to trap less air. 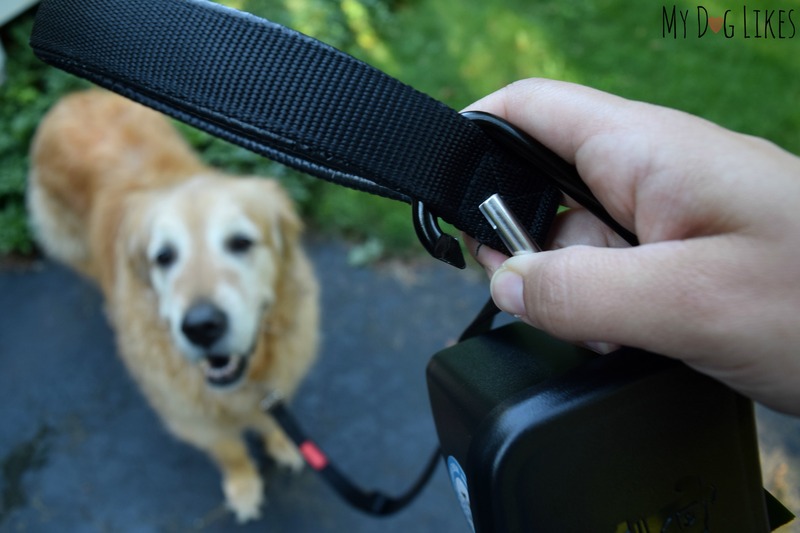 The PooVault comes with both a caribiner and a belt clip so it can be attached wherever you prefer. We tried both methods of carrying and have to say that we prefer the belt attachment. The PooVault can be a bit bulky when connected to the leash, especially if you are also carrying a separate poop bag holder. On the hip it was unobtrusive, out of sight and out of mind. 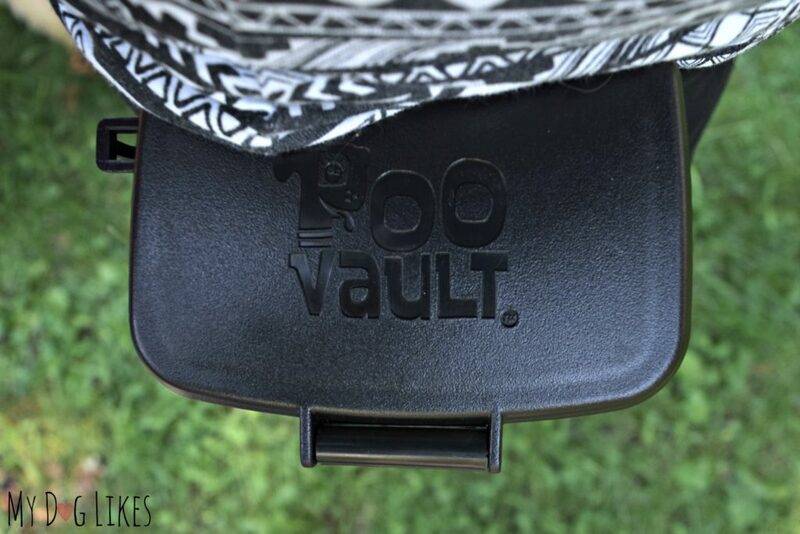 One thing that really sets the PooVault apart from similar functioning products on the market is the rubber gasket embedded into the lid. 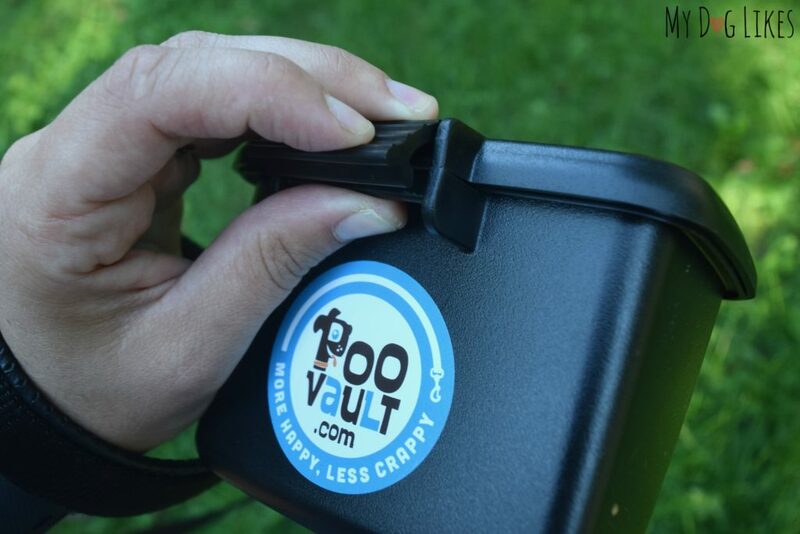 Thanks to this feature, not only does your PooVault solve the problem of carrying used bags around, but thanks to a 360 seal, it keeps all odors trapped inside! How much can a PooVault Hold? 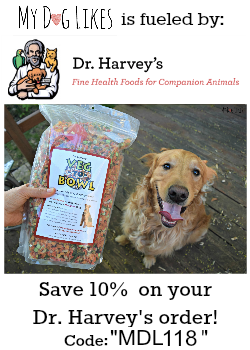 While this is somewhat subjective (since all dogs are different) in our case there is plenty of room for the poop of a large golden retriever. Sometime’s there is room for both Harley and Charlie’s business, but not always! Have a bigger dog or pack? Don’t worry, a larger version is in the works! Does PooVault Really Stop the Smell? We were thoroughly impressed with how well the PooVault contained odors and this is thanks to its all around rubber gasket. They didn’t skimp on this feature whatsoever as the gasket has the perfect amount of compression – thus making a great seal. Once you close the snap you can say goodbye to stink for the rest of your walk! We live in a close knit community and just about every walk includes at least one conversation with neighbors. While everyone loves Harley and Charlie, it is a bit embarrassing to be holding bags of their poop while saying Hello and catching up! 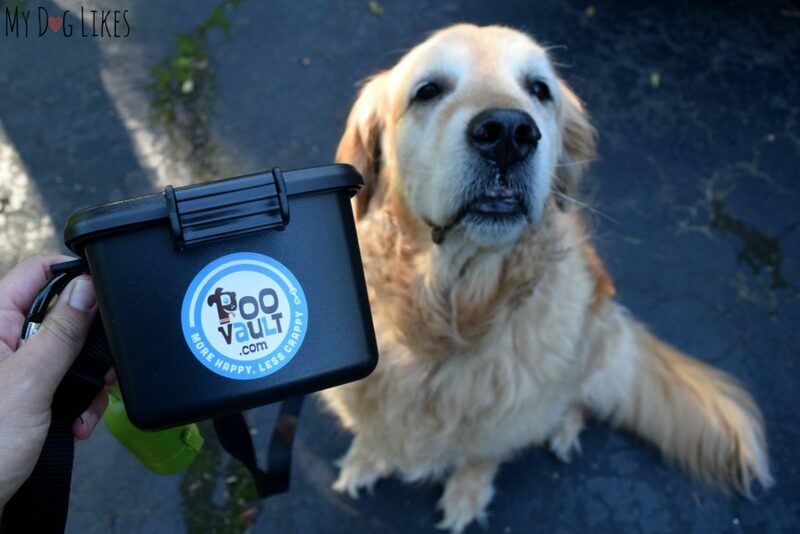 The PooVault keeps both the sight and smell of our dogs poop hidden and has made our daily walks more enjoyable. The PooVault also comes in handy on larger adventures when you’re out on a trail and miles from a garbage can when nature calls. In the case of many State and National Parks there may not even be any garbage cans at all! At these carry in, carry out parks, dog poop must leave in the car with you! Eww!! But not a big deal with the PooVault where you won’t be stuck smelling it all the way home! 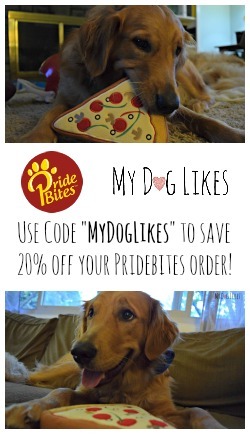 We would highly recommend for any dog owner! Want to try out the PooVault for yourself? Thanks for this generous and precise review. You considered and noticed everything which is really appreciated. No one gets extra points for smelling poop, so why do it? That’s what I say. Yes I do have trouble finding a garbage can because I live in the woods and I have to carry the poop the whole way back, unless I get to the garbage can by the golf course. We have 4 dogs. We don’t normally walk all 4 at once. We sure could use one of these. Thank you for offering this awesome give away! I usually do have to walk with the bag until I get back to the house. Sometimes it is hard to find a receptacle to dispose the poo bags. If I plan ahead I carry a bigger bag. I showed my husband this post and we had the garbage can conversation so what a perfect question. He said it depends on the day of week if he can find a garbage can and i said that i always bring the poobag home because I would feel rude putting it in someone’s can. Either way this product is genius! I can see how this would be helpful especially when there isn’t any trash around. Yup. We just carry the poop bag till we get home…eeew! Not fun. Many areas where we walk there are not any garbage cans around to throw away the poop bag. I bring it home to throw it away. I do. It is a problem because I walk in a lot of nature areas with no trash cans. This looks like a wonderful product. Sometimes yes……I just carry the baggy home with me. Yes, there have been times I couldn’t find garbage cans. It is frustrating! This looks like a great way to make walks more enjoyable All the time! I’m a dog walker and yes! A few of my dogs live in areas where there aren’t any public trash cans. I have to walk farther than I’d like to find a trash can and it’s so annoying! yes i live in a small town and the streets around me only have their garbage cans when its garbage night. It usually comes home with us.If we are in a park and there is an appropriate container then of course we leave it there.I agree that no one likes to smell it so this would be a great thing to have. 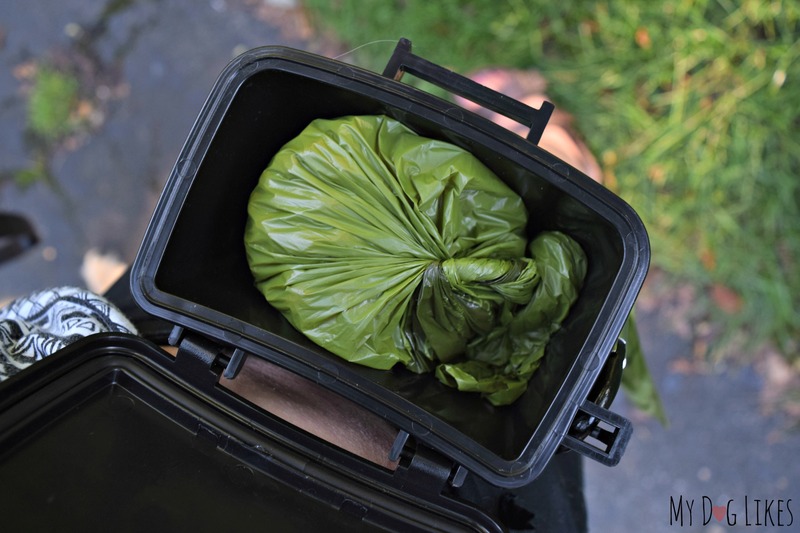 When we’re leaving a carry in – carry out park and there are no garbage cans anywhere, I close the car window on the top of the poop bag so the smell stays outside. It flaps around in the wind as we’re driving, but at least we can’t smell it! I walk my dog where there is a lot of public garbage containers, but travelling this would work especially in the car. Rolling up to a customs booth with your car smelling like poop might get you through faster … might raise some extra questions. when i am out and about i do. however, when i am walking around my property, i dont normally pick up unless it is in the pen. if i picked up their poo, i would have to pick up the deer, geese, foxes, etc. i wish there were more trashcans for pets outside. i rarely see them even outside petstores. Yes always have trouble finding a garbage can on my walks and wind up carrying it back home with me to my garbage pails! I have The Fifth Paw which works well but I don’t always have the leash it is attached to. This will really help. Yes! They are supposed to have them around our community, but they are never where our dogs chose to go. Seems like our pups have a knack for doing their business far from a can, doesn’t it?! Yes! I hate carrying around that little baggy with poop in it. This would be awesome to have for my sweet rescue Stormy! Good luck, Kimmy! Thanks so much for stopping by and entering! Thanks for the info. I sure could use one of these. This product is awesome. I usually walk around my neighborhood and carry the poop home with me. The problem is what to do with it after I get it home! I only have a chihuahua so it isn’t elephant poop but it sure does stink! I can never find a can, however I always carry something with me when walking my dog. I always have trouble finding a garbage can on my walk. How cool – I’d love to see more of this! Though we have yet to encounter such a system in our travels thus far. Yes, always! We live in an older neighborhood. Your lucky to find a street with a sidewalk. I would say 60/40 with 60 being lucky with trash cans. This would be great for my kids and I; my kids walk our dogs everyday we get home from work/school also.